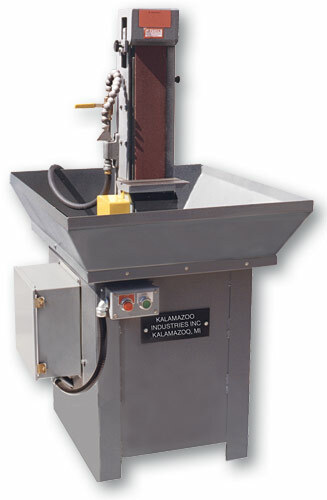 S460W 4 x 60 inch wet abrasive industrial belt sander was designed with a beefed up frame, heavy duty stand and a heavy duty motor for medium deburring applications all while keeping your parts cool while your sanding. S460W 4 x 60 inch wet abrasive industrial belt sander unit is sold with either a powerful 3HP 1PH, 110V or 220V or 3Ph, 220V or 440V (specify phase and voltage at time of order). GREAT FOR POLISHING IN METALLURGICAL APPLICATIONS! 4″ x60″ belt, 3 hp 1 phase or 3 phase motor, Magnetic 24 volt switch. 3HP 1PH 110V amp draw is 24 amps and 220V amp draw is 12 amps. 3HP 3PH 208V amp draw is 6.6 amps, 220V amp draw is 6.4 amps and 440V amp draw is 3.2 amps. Flood coolant – 10 gal tank, 1/3 hp pump, splash guards. Dimensions: L 36″ x W 24″ x H 63″ , Wt: 585 lbs.